It may feel counterintuitive, but throwing open the windows to the sun is a sure-fired way to make your house feel like a sauna. Instead, try shutting the windows and closing the blinds (or curtains) and your rooms will instantly feel cooler. Consider thermal blinds, solar sun screens and window film for maximum effect. Make sure you only open windows when the heat has died down and the air is cooler outside. 2. Create a through draft. If you really want to keep the windows open, make sure you open windows across opposite sides of your home; allowing air to travel from the front to the back of the house. You might have to position furniture to stop doors and windows slamming! 3. Invest in a fan. There are a huge range of fans and air-conditioning units available, from inexpensive ones at just a few pounds to expensive devices with a host of cooling features. The key is to use them strategically to get the air moving. Point them towards an open window to push the air out or to create a cross wind across your home. You can also place a bucket of ice in front of the fan to help cool the air. Now is not the time to sleep in silks, satins and polycottons. 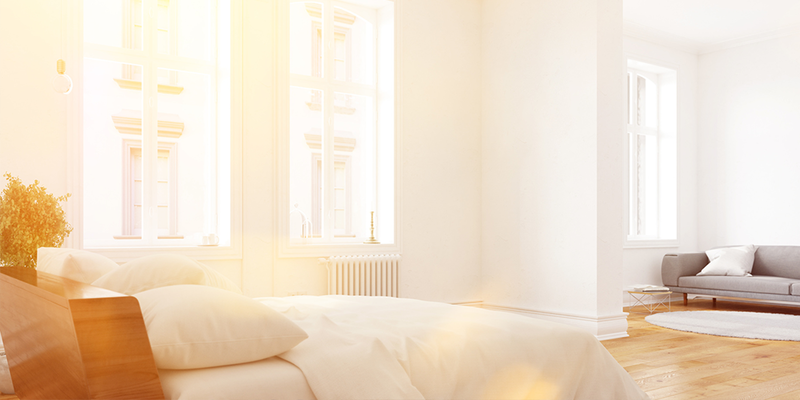 Instead opt for breathable 100% cotton sheets or light coloured linens to help you keep cool. Not all of us have the luxury of choosing where to sleep at night. But, as heat rises, if you can locate your bedroom on a lower floor you should have a more comfortable nights sleep compared to a hot attic bedroom. It may seem obvious, but electrical appliances radiate heat. Instead of using your oven or hob to cook, why not use a barbeque outside instead? If you need an excuse not to use the dishwasher, washing machine or tumble dryer! Now is the perfect time! Switch off as many appliances as you can, to help keep your home cooler. When you need to turn on the lights, consider low-heat CFL lightbulbs and dry your washing outside instead . Hot showers create excess heat and humidity. Turn the temperature down and it will help keep you cool. Taking shorter showers also help to reduce humidity. Hot water bottles are great in the winter, but did you know that you can also fill them with water and then freeze them? Fill your hot-water bottle with cold water and pop it into the freezer. It'll create a lovely ice pack to keep you cool! This may not be a solution for today! But when planning your home interior and exterior colours! Go for cooling whites and soft greys instead. The cooler colours will help reflect the light, helping to cool your house down, and also create a lovely calming environment. Again, this isn't a solution for today. But insulation, more commonly known in the UK for its heat retention properties, is also a great way to keep the heat out. A well insulated house is warmer in the winter and cooler in hot summers.